Enjoy our expanded hot breakfast featuring Biscuits & Gravy, Eggs, and Bacon NEW! Samsung Flat-panel TVs with 30 channels of HD programming. Easy-access Plug-and-Play feature makes it simple to connect electronics. 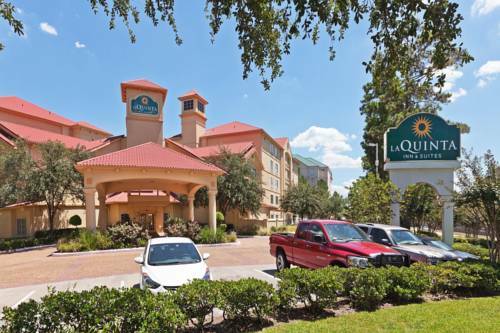 The interior corridor, 5-story La Quinta Inn & Suites Bush Intercontinental Airport South is just 1 mile south of the airport on John F Kennedy Blvd. From Sam Houston Tollway, exit John F. Kennedy Blvd and head north. We offer free shuttle service to our hotel guests to and from the airport. The shuttle runs from 5am to 11pm daily. Guests must call from airport for pickup. There are an extensive list of neighboring businesses such as: Ceva Logistics, Baker Hughes, United/Continental Airlines, Exxon Mobil, Halliburton, GE Energy, Intec, US Foodservice and SWN. Loosen up in the seasonal outdoor pool and hot tub, and work out the kinks in our fitness center. We have meeting facilities, wireless Internet access throughout the hotel, a barbeque grill on property, and there are plenty of restaurants in the area. Be sure to take advantage of the Bright Side Market conveniently located in the lobby, offering a selection of snacks, soft drinks, food items and sundries available for purchase. Rooms at the La Quinta Inn & Suites Bush Intercontinental Airport South are spacious, comfortable, and include free high-speed Internet access. King and two room suites are equipped with microwaves and refrigerators. No need to request our free Bright Side Breakfast with biscuits & gravy, eggs and bacon, served by our courteous staff each morning. We also offer a convenient Stay and Go 10 day parking package with free shuttle service to and from Bush Intercontinental Airport.